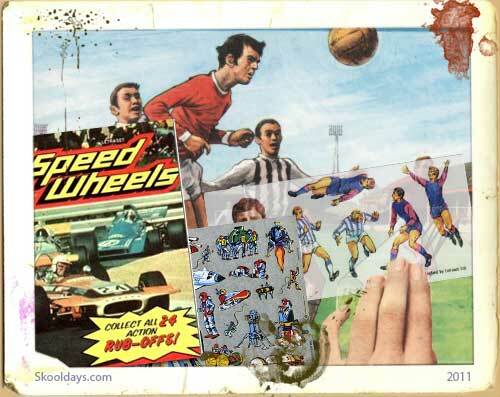 Often known as ‘Action Transfers’, there was Castles and catapults, Racing cars, Moon Exploration transfers, Circus scenes, Football transfers. in the Seventies transfers were big. Simply you would get a sheet of transfers, and a background scene and place the sheet down and rub the transfer with an old coin or pencil onto the scene, the transfer then stuck to the scene. Once a transfer went down, there was no undo button, so you had to commit once only. Nothing was more upseting than realising you had put your transfer in the wrong place. If you tried picking it off it just made a greater mess. This was one of those one way tickets that if it went wrong you often followed with tears. In effect it was a 1970s Letraset for kids. Rub-on transfers comprised of a sheet of paper with a printed scenary and a transparent sheet of coloured transfers containing themed people, casteles vehicles all sorts of action shots for the background scene. I have been trying to find out what I was remembering for years! I could vaguely see it and remember how I felt but not know the product. Thanks! I am looking for a writing pad for kids that my kids enjoyed 25 yrs ago. It was a rubbery pad with a plastic sheet on top that had a sharp wooden stick to write with. When you wanted to erase you simple pulled up the plastic sheet and start over again.